The LTD was launched as Ford’s new flagship model, replacing versions of the imported U.S. Galaxie. It marked a bold initiative by Ford, determined to capture the local top of the range market and become the de facto limousine of choice for government and business. As such, they were happy to alter the basic structure of Falcon/Fairlane and obsorb the cost in the pursuit of the market, and the LTD represented a stretching of the chassis, acquiring more length most noticeably in the rear doors and roof. Interior appointments were of the finest that could be fitted, and so well-equipped were the cars that the options list was almost negligible. While it is common currency to assume that the LTD name was derived, as for the U.S. equivalent, from the term Limited, in fact it stands for Lincoln Type Design and was a measure of Ford Australia’s aspirations for the car. Once again, a two letter code was used to differentiate the models. It is immediately apparent that although the basic form of the car is based on the XA/XB Falcon and the ZF/ZG Fairlane, Ford made efforts to move the LTD upmarket, both in scale and style. The car featured a distinctive grille with head lamps hidden behind vacumn operated doors. Tail lamps appeared full width at the rear, but design regulations prevented them from being sequential in operation, and the wheel trims, while proving to be vulnerable, added to the impression of style. Being released in August, 1973, some months before the XB GT Falcon, the LTD also has the distinction of introducing four wheel disk brakes onto the local Australian market. While officially titled the P5, the first LTD has also become known as the FA. The FA was manufactured between August, 1973 and September, 1976. 7003 were produced. Some more photos of the P5 LTD here. 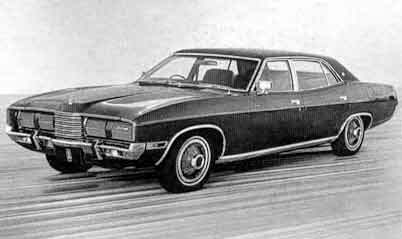 The Landau was a coupe version of the LTD, based on the Falcon hardtop. It retained the frontal treatment of the full size LTD with its disappearing head lamps and the full width tail lamps. The rear quarter window was altered, being shorter and squarer than that of the normal hardtop, and all came with vinyl roofs. Another unique feature in the interior was the fitting of individual bucket seats in the rear, rather than a bench. 1385 were produced. Once more it is apparent that the P6 LTD is based upon the equivalent Fairlane, but with an impressive frontal treatment. With its Rolls Royce style grille, and the large circular head lamps set in a bluff vertical front panel, the P6 presented a bold and dominating presence to the road. Also impressive was the even greater wheelbase, and a list of standard features that wanted for nothing. Mechanical changes were made to allow for creeping emissions regulations and improve the handling, and a new and unique dashboard was fitted. The P6 was manufactured between September, 1976 and May, 1979. 5896 were produced. Some more photos of the P6 LTD here.